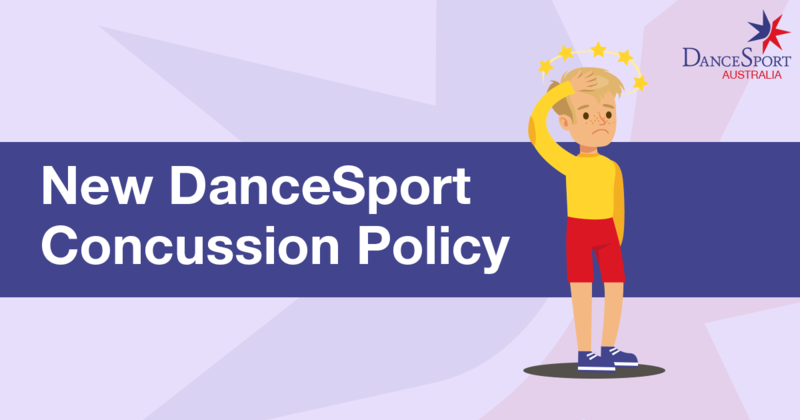 DanceSport Australia is committed to a fair and safe environment for all DanceSport members and participants. In so doing, DanceSport Australia works and cooperates with all Australian and state government agencies to bring about that safe environment. Concussions can occur in daily activity as well as during any sport or recreational activities - including dance. Concussions can have immediate and long lasting effects on an individual. Therefore, all concussions are considered serious. It is essential that dancers, dance educators, dance coaches, parents, and healthcare providers learn the signs and symptoms of concussion and what to do if a concussion occurs. Concussion refers to a disturbance in brain function caused by trauma to the head or body that can alter brain function. Even what might be considered a “mild” bump, blow, or “ding” to the head can result in severe consequences - serious consequences are not limited only to those with loss of consciousness. Less than 10% of concussions involve a loss of consciousness. “Mild” impacts may affect the dancers’ ability to perform daily mental and physical tasks, may result in changes in mood and personality, and may reduce the dancers’ ability to safely participate in dance activity. Each concussion is unique and each affects the injured dancer in a different way. Recognition and proper response to concussions when they first occur is imperative to help prevent further injury or even death. A dancer may experience or demonstrate any of the signs or symptoms below after sustaining a trauma to the head or body. Keys to identifying concussion include an observed or reported forceful bump, blow or jolt to the head or body that results in rapid movement of the head AND any changes in the dancer’s behavior, thinking, or physical function. It is important to remember that you can’t “see” a concussion and that not all dancers will experience or report the symptoms right away. Some dancers may wait for hours or even days after the injury to report a problem. Most individuals with a concussion will fully recover in a timely manner given early and proper care. However for some individuals, signs and symptoms of concussion may last for days, weeks, or longer and may be present during daily functioning and not only with exercise or dance activity. Research informs us that some aspects of cognition and the body's balance system can be affected for months following concussion. Dancers who experience any of the signs or symptoms listed above following a trauma to the head or body should be immediately kept out of dance participation and any activities that increase symptoms until a licensed healthcare provider, experienced in evaluating concussion, says they are symptom-free and that it is safe to return to activity. A repeat concussion that occurs before the brain has recovered from the first trauma —usually within a short time period (hours, days, weeks)—can slow the recovery process and/or increase the chances for long-term problems. Thus the importance of monitoring and clearance by a licenced healthcare provider trained in concussion management. Once the dancer’s symptoms have resolved with daily activity, the dancer should follow a step-wise return to dance protocol. The dancer should only progress to the next level if symptom free at the current level and if at any stage the dancer experiences a recurrence of symptoms, he/she needs to return to the previous level of activity until the symptoms resolve and should not try to progress for at least 24 hours. A dancer may work with a number of licensed health care providers who will assist in his/her recovery including: certified athletic trainers, physiotherapists, sports medicine physicians, neuropsychologists, psychiatrists, and/or osteopaths.